﻿ what’s under your fridge? You really don’t want to know what was under my fridge when we pulled it out. But I’m going to show you anyway, because that’s what bloggers do. We show you the worst of what’s going on in our lives, because we’re all on the same team here. Are you ready? I’ll let you look at the old fridge first. We bought it from a guy at Viktor’s office for a steal when we moved into our house. It was old when we bought it, and we made it older. Ick city, right? I swear to you I wash my floors all the time, I just couldn’t get under there. Darn that’s gross. We got it all cleaned up in time for the new fridge though. You want to make a good impression for future appliances. Show them you’ll take care of them, give them a loving home. Isn’t she a beauty? I did two things to help her feel at ease: put my Rosie the Riveter magnet on her so she knows how things work around here, then I filled her up with my favorite beverage. You know, to give her a warm welcome. I’m just trying to be a good hostess. << an open letter to swiss miss. I love it with an unnatural love. A few years ago I was talking on the phone with a friend who was breathing heavy. When I asked her what she was doing she told me she moved the fridge and was cleaning out from underneath it. DUDE. Your fridge tells you the temperature! So rad. 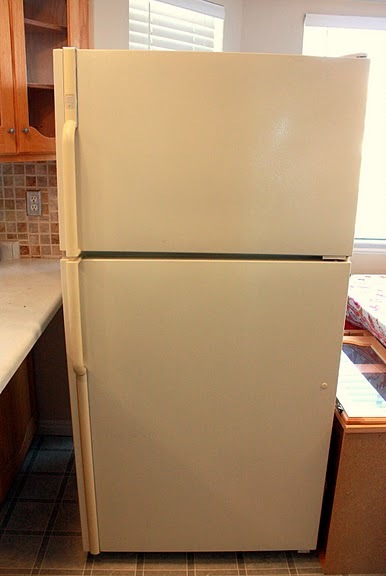 I gagged a little when I saw what lived under your old fridge! That's not too bad – at least there's nothing dead under there! But being an ex-farmer's wife that lived in the aussie bush, my concept of what's bad might be a bit out of kilter. Beautiful fridge. And how kind of you to give it a clean home. I don't even want to know what's living under my fridge!! 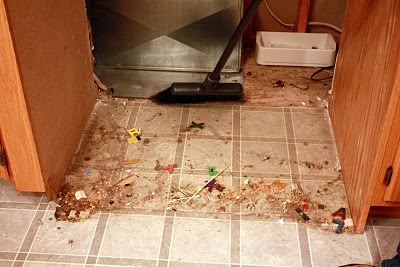 I'm sure that new fridge in all it's silver beauty won't let your floor get that messy again! I am so jealous of your new fridge. I would take up residence in that sweet hunk of shiny metal. It's beautiful; literally it brings tears to my eyes how fab it is. And the floor under the old one? It's got nothin on mine, trust me. I guess we must be kindred nasty-under-fridge souls. Wow, that picture made me a little nauseous – more so, because I'm certain mine looks exactly the same! Your new fridge is gorgeous – I'm jealous. Congrats on the new fridge! She's a beauty and sure to feel very at home after such a great welcome! What I want to know is – WHAT WILL YOU DO TO YOUR CHILDREN if they scratch it? I've had two SS fridges and after about a week both of them looked like they got into a losing battle with an army of housecats. But that is exactly what mine looked like when we moved it to redo our kitchen floor. THAT is a sweet new fridge! Ewww! I can't say that say that too loudly though because I bet there is a similar scene under my fridge as I type this. 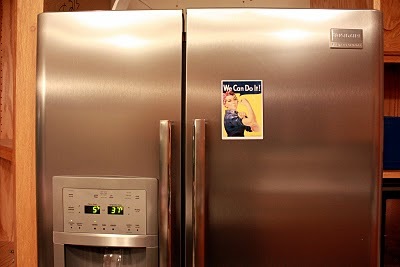 I lurve your new fridge and think that DDP is the perfect item to break it in! We moved our stove out to replace it and found rat poison under there… my 10 month old then proceeded to crawl back and try to eat it. EAT IT. I'm sure Poison Control writes these stories down just to get a good laugh in now and then. 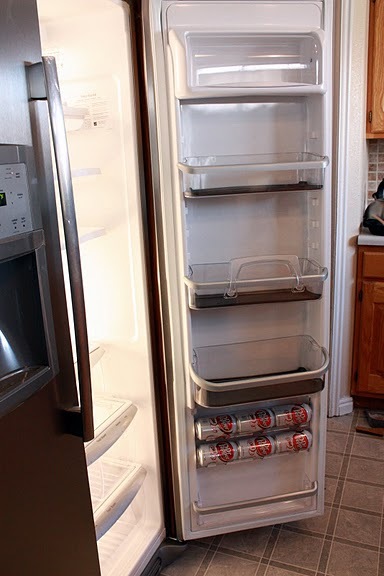 if i could replace my fridge with one like that, i'd clean up under everyone else's fridge on the block. okay. maybe not everyone's. but totally my neighbor's fridges. totally. Oh girl. You are brave. We moved ours a while back to paint, and I about died. I've lived in private shame ever since. Happy to know it's not just a "personal problem". Lucky you and your new kitchen! Lucky girl (to get the fridge, not the mess)! I love how big each side is. Talk about movin' on up, sister. Good on you! I am having MAJOR fridge envy missy!!!!! Also, I could go for one of those tasty Diet Dr. Peppers right about now…..
We are in the middle of a pretty big reno right now and when we first took the old appliances what we found wasn't too pleasant….unless you were my dog. She was loving the smorg…yep that's gross I know. I always said we should have named her Hoover.